I hope young Texans old enough to vote, in their late teens and twenties, have registered to vote and will vote in the 2016 primary election. 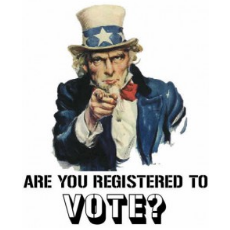 The voter registration deadline is Monday, February 1, 2016. But even holding their Voter Registration Certificate, many young Texans may not be able to vote, because they don't have a driver's license, concealed handgun license or passport. They may not be able to vote because Texas' SB14 voter ID law remains in effect, as of the date of this article, pending further action by the U.S. Court of Appeals for the Fifth Circuit. Many college dorm resident students attending college in a city or state away from their home don't have a car or a driver's license - or their birth certificate. But students attending college in a city or state away from home can request a vote-by-mail ballot from their parent's home county elections office, if the student is registered to vote in their home county -- and did not re-register in the county where they attend college. No ID is required to request and vote a mail ballot from your home county. Application for a Ballot by Mail - click here. 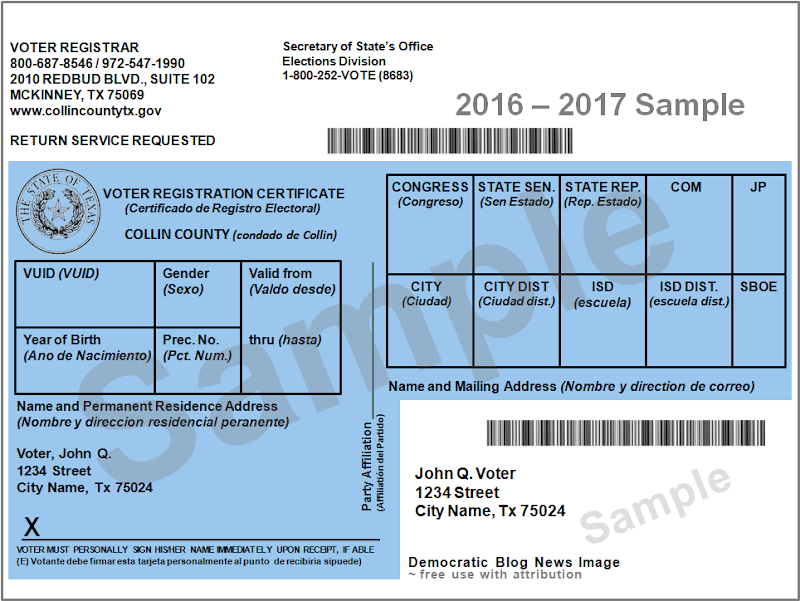 Any registered Texas voter who is 65 years or older or disabled, or who will be out of the county on election day and during the period for early voting may request and vote a mail mail ballot. If you are eligible to vote by mail - request your mail ballot today! The last day to submit mail ballot application is Friday, February 19, 2016 - received at the county elections office, not just postmarked. To check your registration status in a Texas county - click here. If you find you are not registered, you can find the Voter's Registration application by clicking here. For specific information about voting in Texas, click here. Many other citizens, including women and the elderly, also find they face just extraordinary complications in obtaining their Texas driver license, or other ID card. To get a government-issued ID, the state requires a certified copy of your birth certificate, from your state of birth. Many find they don't have an official state certified birth certificate, This group includes many African-Americans in their mid-fifties and older who were delivered by midwife in an era when many hospitals did not admit nonwhite mothers. It also includes unofficial adoptions of children given to relatives or other families to raise. Others may have had their birth and marriage records destroyed by tornado, hurricane, fire or flood. The Texas Department of Public Safety women often challenge women on their "true identity" because 90% change their names on marriage to their husband's surname, which is different from their birth certificate surname. Many Americans don't understand why some voters don't have a driver's license or other photo ID. A Rasmussen Reports poll in mid-2015 found support for photo ID laws at 76 percent. Democrats often accuse Republicans of attempting to keep minorities from the polls with the photo requirement, but even the Democratic Party faithful see approve of voter I.D. requirement. Rasmussen found 58 percent of Democrats believe a government-issued ID must be shown to be able to vote. The poll also found 92 percent of Republicans and 78 percent of voters not affiliated with either major party support photo ID laws. Most do believe non-eligible (non-citizens) voting is a significant problem; Only 37 percent of all voters think it is more common for eligible voters to be prevented from voting because they lack a photo ID, than it is for non-eligible voters to vote. With only one week to go before the Iowa caucuses, the three remaining Democratic candidates for President took the stage at Drake University in Des Moines on CNN Monday night for a Town Hall discussion moderated by CNN New Day program anchor Chris Cuomo. Cuomo asked former Maryland Governor Martin O’Malley, Vermont Senator Bernie Sanders, and former Secretary of State Hillary Clinton to answer a series of questions. “America’s looking for a new leader… We can not be this fed up with our gridlocked dysfunctional national politics and think that a resort to old ideologies or old names (ie. Clinton) is going to lead us forward… America needs new leadership and I need the O’Malley supporters out there on caucus night to hold strong and move forward like Iowa does.” Forward is not referring the status quo and old ideologies attached to the Clinton name. Texas primary early voting starts third on Feb 16th, after the Iowa Caucuses on Feb. 1st and New Hampshire Primary on Feb. 9th. Heavy media coverage of the Iowa caucuses and New Hampshire Primary leading into the start of Texas early voting will drive election interest among Texas voters of both parties. That media attention will prime the turnout pump for the first week of Texas early voting. Media coverage of Nevada's caucuses on Saturday Feb 20th, half way through the Texas early voting period, will keep Texas early voting interest high. During the last week of Texas early voting, media coverage leading into South Carolina's Saturday, Feb 27th primary will also keep interest high. 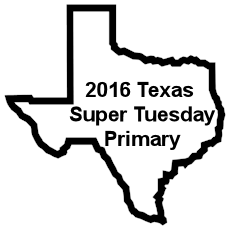 And heavy media coverage of South Carolina's Saturday primary results during the Sunday and Monday before Super Tuesday will drive election day turnout interest among Texas voters and voters in the other Super Tuesday state. Iowa precinct caucuses will allocate 46 pledged delegates on Monday, Feb. 1, 2016. The byzantine rules of Iowa Democratic Party caucuses give outsider presidential candidates a chance at legitimacy — or sudden irrelevance. Unlike Republican caucus rules, where all votes are counted equally, Democratic Party caucus-goers gather in groups for each candidate during a 30-minute alignment period. If a candidate's group count does not reach 15 percent of the total attendance count, its members must realign with a different candidate to be counted for delegate apportioning. The complicated Democratic caucus rules are tilted toward normalizing the strength of candidates, especially in two and three person races. Only the number of delegates awarded in each of Iowa's 1,681 precincts will be published on caucus night. (video right documents a 2008 caucus. No official record of the each candidate’s share of total caucus vote counts, which usually mirrors polling data, will be published. Candidates can easily tie in the precinct delegate count allocation, even if one candidate has far more support inside the caucus room. Whether the Sanders campaign or Clinton campaign is more successful at getting out caucus voters, they're relative delegate count reported by the precincts — individually and collectively — may in fact look more like a draw than a win. Profit-seeking in the banking and health care industries has victimized Americans. Now it’s beginning to happen in education, with our children as the products. There are good reasons – powerful reasons – to stop the privatization efforts before the winner-take-all free market creates a new vehicle for inequality. At the very least we need the good sense to slow it down while we examine the evidence about charters and vouchers. The recently updated CREDO study at Stanford revealed that while charters have made progress since 2009, their performance is about the same as that of public schools. The differences are, in the words of the National Education Policy Center, “so small as to be regarded, without hyperbole, as trivial.” Furthermore, the four-year improvement demonstrated by charters may have been due to the closing of schools that underperformed in the earlier study, and also by a variety of means to discourage the attendance of lower-performing students. Texas charters had a much lower graduation rate in 2012 than traditional schools. By now even a narcoleptic could recite the GOP's parody of Democrats. The party of "big government." Champions of "class warfare" programmed to "tax and spend" other people's money. An amalgam of interest groups divorced from the national interest. Practitioners of "identity politics" bent only on getting to 51 percent. Enemies of the "job creators." Enablers of listless bureaucrats and their shiftless dependents. Spineless hand-wringers with no respect for our past or faith in our future. A lot of this is political bilge, a shameless inversion of the GOP's divisive politics and intellectual vacuity. In debate all three Democratic candidates are specific, informed and grounded in a reality largely absent from the Republican contest. But all too often, and particularly on the stump, Democrats themselves can verge on self-parody, purveyors of programs bereft of a larger vision. According to public opinion expert Peter Hart, the great majority of Americans want a new course after the Obama years, and by two to one believe that America is headed in the wrong direction. Bilious as it is, Donald Trump's pledge to "make America great again" touches something deeper than just resentment or nostalgia -- a desire for national renewal which, at its best, could inspire a more transcendent politics, transforming widespread angst about our future into a shared and positive mission. All too often Democrats who speak of pragmatism rather than with vision fail to transcend. Sunday's Democratic debate, hosted by NBC, was the party's second-most watched this election cycle, with about 10.2 million viewers tuning into the channel, according to the network. While NBC's ratings beat out the last two Democratic debates it isn't even close to the first Democratic debate hosted by CNN, which brought in 15.3 million viewers. ABC had about 7.8 million viewers and CBS had about 8.5 million viewers opposite the debate on NBC. The uptick in audience share last night, over the last two DNC debates, could be the result of the last two debates were also held on Saturdays, which typically see lower ratings than Sundays. The third debate on the Saturday before Christmas day on ABC attracted only 6.71 million viewers. The second debate attracted 8.5 million viewers on a mid-November Saturday when two Iowa university football teams matched off. And interest may have increased with Sen. Bernie Sanders (I-Vt.) closing the polling gap with former Secretary of State Hillary Clinton in early voting states Iowa and New Hampshire, which has resulted in Clinton going on the attack against Sanders by pointing out their differences on health care and gun control. The Republican debates have all lacked what the Democratic debates have. This was another substantive debate among the Democrats, devoid of the histrionics, name-calling, and fact-free pronouncements that are pro forma in the Republican presidential debate shows. The Democratic candidates disagree on how to achieve certain policy goals, but they all agree on those big goals. Democrats have a real vision for the country. There isn’t a battle for the direction of the party happening on the Democratic side. Any of three Democratic candidates would make a better president than any of the dozen Republicans running for the White House. 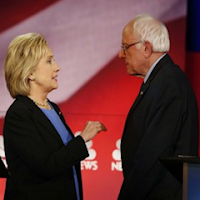 Democrats demonstrated their competence and ability to govern during the NBC debate. Clinton, Sanders, and O’Malley have the policies that are missing on the Republican side. While Republicans fight the culture wars and rage against the nation’s changing demographics, Democrats are speaking to the real problems of ordinary Americans. Case in point -- When Hillary Clinton and Bernie Sanders were asked if they saw any scenario where ground forces could be used to combat ISIS. Former Sec. Clinton said, “absolutely not.” Sanders blasted Republicans for not learning the lessons of Iraq, and he said that using ground forces to combat ISIS would lead to perpetual war and be a complete disaster. Sanders said that ISIS won’t be destroyed with American troops in perpetual warfare. Martin O’Malley said that he believed that President Obama was doing the right thing. O’Malley said that he appreciates that Democrats don’t use the term boot on the ground. But that's not to say the fourth Democratic debate was all kumbaya. Clinton and Sanders presented different visions on their approach to governing – big ideas verses pragmatism. While Sanders urged his audience to “think big,” Clinton repeatedly cautioned thinking big is not pragmatic. ABC’s Rick Klein: The debate re-framed the race as “a battle pitting the party’s head against its heart. Fact checkers of the last Democratic Debate found that nearly all of the major claims made by the candidates were actually true. We also talk about the state of mind of those who criticize President Obama's, his assessments, his proposals, and his vision for the future, despite the facts and realities he referenced and has spoken about in prior SOTU addresses. To wrap up the program, we discuss new polling data on Hillary Clinton and Bernie Sanders, as it relates the Democratic Party caucus and primary schedule in February. Over the last few weeks Hillary Clinton’s campaign has been hitting fast-rising rival Bernie Sanders over his longtime advocacy for single-payer health care. That's a system in which everybody, or almost everybody, gets insurance directly from a government-run "Medicare for all" program. The Clinton campaign's assault on Bernie Sanders over health care got more intense this week as Hillary Clinton's daughter, Chelsea, made the claim Sanders intends to dismantle Medicare and Medicaid -- and "strip millions and millions and millions of people of their health insurance." But in 2008, Clinton decried the notion that a fellow Democrat would attack another for proposing universal coverage. Health care was also a major issue in the 2008 Democratic primaries. At the time, Clinton supported an individual mandate requiring everyone buy a commercial health insurance policy or pay a fine, as was eventually enacted in the Affordable Care Act, otherwise know as Obamacare. Then Preisdential candidate Barack Obama did not at the time support the individual private insurance mandate. The South Carolina governor followed up her opening shot at Pres. Obama by savaging his foreign policy and highlighting Republican priorities on immigration, taxes, education, and the Second Amendment. Haley's alternate state of the union was a clear attempt to disparage the Democrat in White House to reconstitute conservative governing ideology as good governance, as Republicans have done since Pres. Bush moved out of the White House. During his State of the Union address last night, President Obama seemed eager to tout the nation’s economic gains. “The United States of America, right now, has the strongest, most durable economy in the world,” he said, before rattling off key statistics, including rapid job growth and the strength of the American auto industry. “Anyone claiming that America’s economy is in decline is peddling fiction,” the president added. The Great Recession legacy Pres. George Bush and his Republican controlled congress left to the United States after eight years in office the nation's longest, and by most measures worst economic recession since the Great Depression between December 2007 and June 2009. The follow discussion reviews the course of the economy following that recession against the background of how deep a hole the recession created – and how much deeper that hole would have been without the financial stabilization and fiscal stimulus policies enacted by Pres. Obama in early 2009. Several polls out this week show Hillary Clinton trailing (to various degrees) in New Hampshire, and now, also falling behind in Iowa in the January Quinnipiac University poll taken after New Year's Day and completing Jan. 10th. In a mid-November Quinnipiac University poll, Clinton had the support of 51 percent of likely Iowa caucus attendees to Sanders' 42 percent, for a 9 point lead. Quinnipiac last polled Iowa in December, at which point Hillary Clinton led Bernie Sanders by 11 points. That poll was completed Dec. 13. The Iowa poll out on January 12, 2016 showed a five-point 49 percent to 44 percent advantage — for Sanders. That's a 16-point swing over the course of a month. This also wasn't the only poll to show Sanders with a lead. A survey from American Research Group this week has him up three points. So what happened to Clinton? Well, part of it is that her favorability slipped. Among all voters, she dropped seven points in the head-to-head matchup (Sanders gained nine), but the percentage of people viewing her favorably fell from 81 to 74. Among groups that have preferred Sanders (like men), Sanders's lead increased. When President Obama took office in January 2009 after 8 years of Pres. Bush's administration, America was experiencing the worst economic crisis since the Great Depression. Job losses were mounting by 800,000 jobs per month, people were loosing their homes and life savings, and tens of thousands of U.S troops were deployed in Iraq and Afganistan. Seven years later, our businesses have created 14.1 million new jobs over the past 70 months. America has reformed its health care system, reinvented its energy sector, and brought home more than 160,000 troops. President Obama used his final State of the Union address to reflect on his presidency and accomplishments, and the work yet to be accomplished. About 31.3 million people watched President Obama deliver his last State of the Union address on network and cable television Tuesday — the smallest audience recorded since ratings company Nielsen started keeping track in 1993. The ratings count the 12 networks that carried the address live: ABC, Al Jazeera America, Azteca, CBS, CNN, FOX, FOX Business Network, FOX News Channel, Galavision, MSNBC, NBC and NBC Universo. Spanish-language Univision also carried the speech on tape delay. These TV ratings numbers do not include other ways people follow the State of the Union address on streaming video sites like YouTube and social media channels like Facebook, Twitter and Instagram. This year, the White House added Amazon video and Snapchat to the mix. Nielsen said 9.8 million people saw one or more of the 2.6 million tweets sent in the United States about the speech. The Twitter audience peaked at 30,600 tweets-per-minute immediately after the president's speech. Watch the video of President Barack Obama delivering his State of the Union address before a joint session of Congress in Washington on January 12, 2016. Representative Debbie Wasserman-Schultz (D-FL), the controversial chair of the Democratic National Committee (DNC) has a progressive primary challenger in her bid for re-election in Florida’s 23rd Congressional district. Tim Canova, a little-known liberal economist and law professor, announcedThursday that he would challenge Wasserman-Schultz, who has aroused the ire of progressives for her perceived supplication to corporate interests, outdated policy beliefs, and mishandling of the primary election season. 2015 was the second hottest on record in the United States since data collection began in 1895, the National Oceanic and Atmospheric Administration announced Thursday. Last year was also the 19th consecutive time that average temperatures in the U.S. exceeded the 20th century average. Everyone born after 1996 has only known warmer than normal temperatures. NOAA also reported that December was record warm for the contiguous United States, with temperatures at 6°F above average. Twenty-nine states had their warmest December on record, while no state was record cold. Mounting evidence behind man-made climate change doesn’t mean that skeptics are backing down, however. The Democratic presidential campaign – unlike the Republican circus – has actually produced a debate in which each candidate’s economic agenda has gotten better and more populist. But as you can see at CandidateScorecard.net, there are also big differences. Both Hillary Clinton and Bernie Sanders agree that America’s long period of stagnant wages and growing inequality has been due to chronic slow growth and high unemployment. InClinton’s words, “getting closer to full employment is crucial to raising wages.” Both are committed to some amount of increased public spending on infrastructure and investments in “green industries.” But the differences between the two candidates on public investment are a matter of scale. 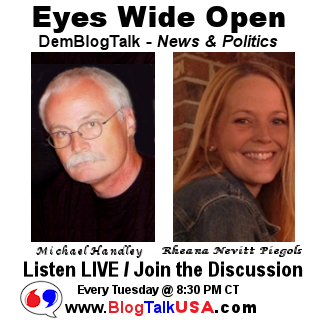 On our Tuesday evening program, my co-host Rheana Nevitt Piegols and I talked about gun safety, among other topics. Each year: More than 100,000 people in America (all ages) are shot in murders, assaults, suicides, accidents, or by police intervention. 31,537 people die from gun violence: 11,583 people murdered; 18,783 self inflicted; and 584 accidental shootings. 71,386 people survive gun injuries: 51,249 people intentionally assaulted by gun owners; 3,627 people survive at tempted suicide; and 15,815 people are shot accidentally. Washington Post columnist E. J. Dionne, Jr. explains why "The gun lobby's con game will come to an end.." As Dionne writes, "... Something important happened in the East Room when Obama offered a series of constrained but useful steps toward limiting the carnage on our streets, in our schools and houses of worship and movie theaters. He made clear that the era of cowering before the gun lobby and apologizing, trimming, hedging and equivocating is over...Bullies are intimidating until someone calls their bluff. By ruling out any reasonable steps toward containing the killing in our nation and by offering ever more preposterous arguments, the gun worshipers are setting themselves up for wholesale defeat. It will take time. But it will happen." At ABC News Gary Langer has "Views on Gun Control: A Polling Summary."